The problem with most video surveillance is that it is not actively monitored. It is recorded so that events can be reconstructed at a later date. While this may prove to be an effective deterrent in many situations, this does limit the effectiveness (and the cost of operation) of the surveillance system. Of course, a major problem with that approach is that the “persons of interest” are long gone by the time the video shows that “yep, you can definitely see some guy cutting off that lock and stealing that…”. Another problem is that unless the equipment is being checked on a regular basis, it may be defeated (or just broken) for a long time before any problems are identified. 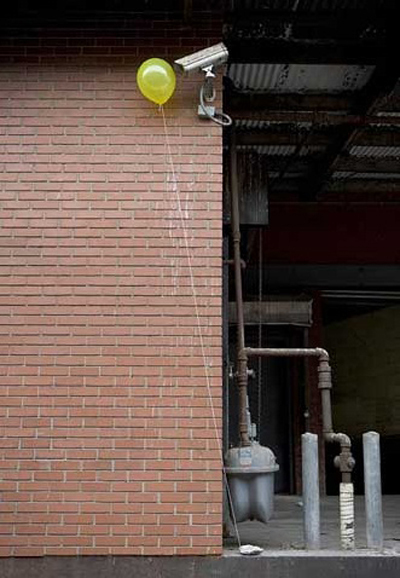 In the photo to the right, an NYC artist William Lamson, has created an interesting photo of hacking (or blocking) a security camera with a helium balloon. This is such a simple and inexpensive attack on the video surveillance camera that I am shocked I haven’t seen this before. I am also certain that the appearance of this in a TV or movie plot is imminent. It would have been pretty simple to use two balloons to block the camera without providing the nice tether to “fix” the problem. This entry was posted in Security Faux Pas and tagged oops, physical security, video surveillance on July 31, 2008 by erikheidt.